Here is an example that uses the ODS HTML destination to create an HTML file that references four PNG files that are created by the GCHART procedure with the DEVICE=ACTXIMG graphics option. Because the ACTXIMG device invokes an SAS/GRAPH ActiveX Control, you can run this example only in a Windows environment. 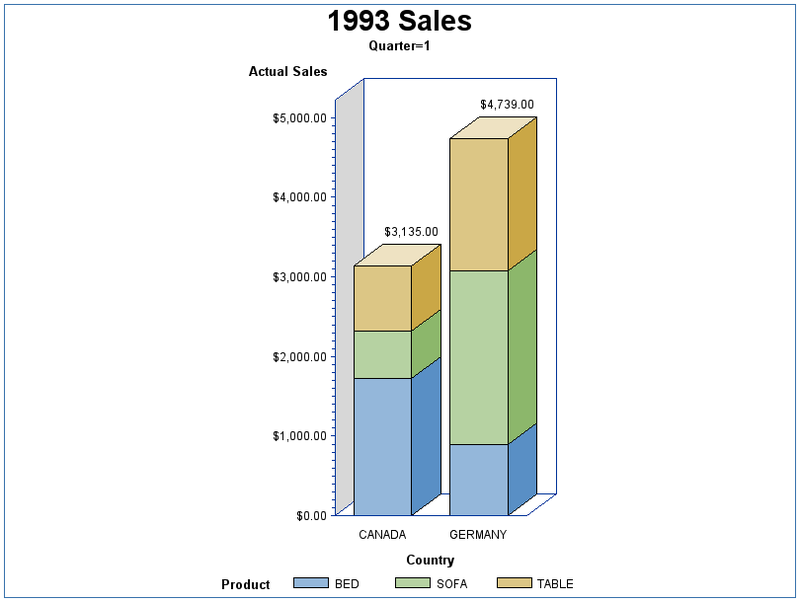 The GCHART procedure in this example uses BY-group processing to display the results of each of the four quarters of the year. Consequently, the procedure produces four separate PNG files. Only the first graph is shown here. To see all of the PNG images in the output, you must scroll down the page in your browser. The following is the complete SAS code for this example. In this example, the output files are sent to the default location. If you want to send the output files to a different location, add the BODY= option to the ODS HTML statement to specify the new location of the output files. You can specify the complete path and filename with the BODY= option (or the FILE= option, which is the same), or you can specify the path separately using the PATH= option, and just the filename with the FILE= or BODY= option. If you want to send the PNG files to a separate location, add the GPATH= option to the ODS HTML statement to specify the new location for the PNG files. See SAS Output Delivery System: User's Guide for information about the ODS HTML statement. Here is an example that uses ODS to create an HTML file that references four PNG files that are created by a SAS/GRAPH procedure. 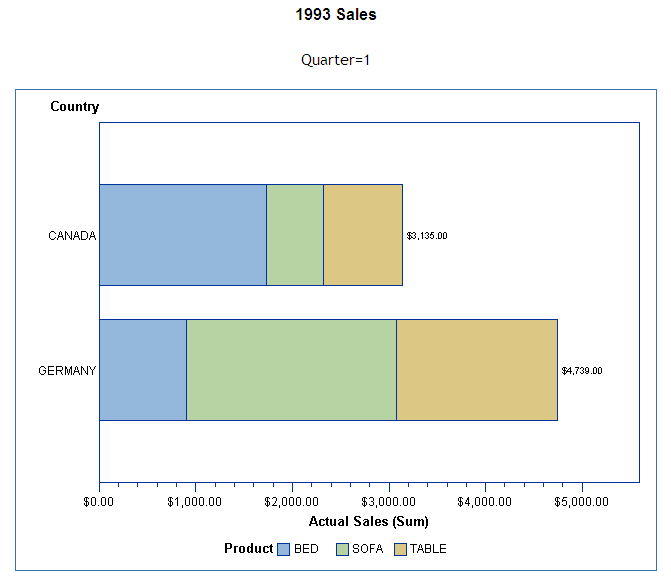 The GCHART procedure in this example uses BY-group processing to display the results of each of the four quarters of the year. Consequently, the procedure produces four separate PNG files. Only the first graph is shown here. To see all of the graphs, you must scroll down the page in your browser. The following is the complete SAS code for this example. In this example, the output files are sent to the default location. If you want to send the output files to a different location, add the BODY= option to the ODS HTML statement to specify the new location of the output files. You can specify the complete path and filename with the BODY= option (or the FILE= option, which is the same), or you can specify the path separately using the PATH= option, and just the filename with the FILE= or BODY= option. See SAS Output Delivery System: User's Guide for information about the ODS HTML statement. If you want to send the PNG files to a separate location, add the GPATH= option to the ODS HTML statement to specify the new location for the PNG files. Notice that a device is not specified in the GOPTIONS statement in this example. ODS uses the PNG device as the default device for the HTML destination. Here is an example that generates Web output with drill-down functionality using the GIF device. In this example, the DEVICE=GIF graphics option generates image output files and the ODS HTML statement generates an HTML output file. The URL= option identifies a link variable that provides drill-down URLs. The values of the link variables are added to the data set with IF/THEN statements. ODS inserts the drill-down URLs into an image map that it generates in the HTML output file. Because the link variable contains the URL string only, the URL= option must be used to identify the link variable. The HTML= option cannot be used in this case. When you display the HTML output file in a Web browser, the following chart is displayed. 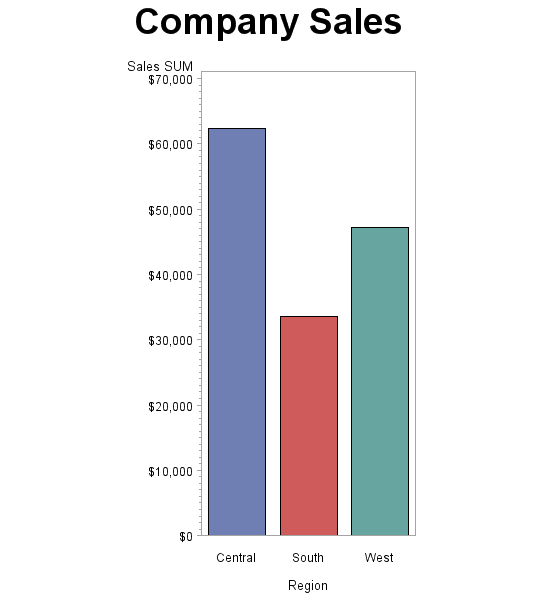 If you click one of the three blocks in the chart, you see a table of the data for that block. 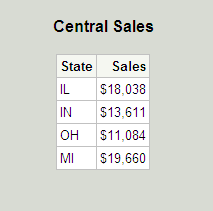 For example, if you click the Central block, the following table is displayed.